Why shouldn’t I buy an aerosol can from the hardware store and spray myself? Cost: In comparison to equal dollar value of an aerosol to PRS’s method of High Volume, Low Pressure (HVLP) spraying, we’ve found that the HVLP technique coats evenly to specified thicknesses and up to four times the surface area of the aerosol can. In addition, PRS procures conformal coatings in volume reducing cost and passing those savings to our customers. Furthermore conformal coatings are mix according to lot sizes, thus reducing waste. Do you work with out- gassing materials qualified by the Aerospace Industry? PRS carries stock of materials that comply with NASA low out-gassing standards. Why is conformal coating so expensive? Commercial coating requirements are generally not considered at the design stage and are an afterthought. Field failures or customer environments change. Another cost driver is processing single units. There is a considerable cost saving if the parts can be processed in panel form. Do I still need to clean my boards prior to the application of a conformal coating? All circuit assemblies need to be ionic cleaned prior to coating. Many may need No-Clean flux removed as well. We offer various cleaning methodologies for Printed Circuit Boards (PCB). For further information contact us at sales@plasmarugged.com. What if I do not have a drawing can PRS offer assistance in writing specifications? Yes, many of our clients allow us to use images of their product. We can establish an engineering document from as little as that. How is conformal coating applied? Conformal coatings can be sprayed, dipped, dispensed or brushed on. Some are vacuum dispensed. 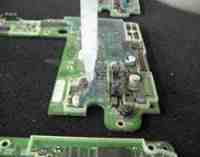 Can conformal coating prevent corrosion? Yes, that is its main purpose. Can conformal coatings dissipate heat? Yes, some coatings can and some can be modified to do so. Yes. PRS has many ways to promote adhesion including low frequency plasma for fluoro-polymers and etching glossy solder masks. Can you assist with tin whisker mitigation? Conformal Coating can mitigate tin whisker growth when all tin areas are covered. Due to the stress on top and bottom of component leads, suitable coverage becomes a necessity. Parylene coating (XY) can coat under and around leads but according to studies it will need to be .002-.004 thick. In addition to Parylene, liquid coatings such as Polyurethane (UR), Epoxies (ER), and Silicone (SR) have been evaluated and may be considered. Each application should be followed up with environmental stress screening (ESS) and accelerated life test to determined suited material. How do you protect a board against reverse engineering? We have many ways and levels of protection. An engineering review may be required to select the best option available for your application. What is Federal Information Processing Standards 140 (FIPS)? Federal Information Processing Standards 140 is a publication standard for Cryptographic Modules used to protect sensitive governmental data in computer and telecommunication systems. It specifies the requirements to meet conformance with security levels (U.S. government computer security standards). Do you offer expedite options? Expedite options are available based on the application and process type. Please contact your Sales Representative for further details. sales@plasmarugged.com. Generally 5 business days. PRS is committed to customer satisfaction please contact us if your shipment is time sensitive. Can PRS provide engineering support to determine type of coating or potting application required? PRS has collectively 200+ years experience in this field. We hope you will take advantage of our expertise. Can PRS remove conformal coatings? PRS can remove all conformal coatings with a few exceptions. How can I determine how much board coverage is needed? Coating the entire board on both sides is generally preferred. Selective coating is available if the design requires it. What quality standards do you work to? PRS works to IPC-CC-830 standards, MIL-I-46058 - Insulating Compound, Electrical for Coating Printed Circuit Assemblies. We are AS9100 & ISO 9001:2008 certified. What are the different types of conformal coatings? There are five different types of conformal coatings: Acrylics (AR), Polyurethanes (UR), Epoxies (ER), Silicones (SR) and Parylene (XY). What type of conformal coating should I use? We at PRS are capable of applying Acrylics, Polyurethanes, Epoxies, Silicones and Parylene. PRS's engineering dept will assist in determining what type of conformal coating is best suited for your assemblies depending on the environment and conditions the product will be subjected to. Why should I outsource this process? No capital investment required, don’t have to deal with hazardous waste management, Volatile Organic Compounds (VOC) levels which are regulated by the Environmental Protection Agency (EPA) and/ or permits. Direct labor can be redirected, immediate access to engineering solutions, technology and expertise. What benefits would I realize by utilizing conformal coatings? Conformal coatings protect the metals on a circuit assembly from corrosion. They also protect from dust, fungus, vibration, chemical, and voltage issues due to spacing problems. Conformal coatings are an organic material applied to circuit assemblies to preserve the surface resistivity through the life of the product. This is one of the reasons the assemblies have to be ionic cleaned prior to coating. All of the coatings will filter out ionic material when exposed to moisture.